As young readers journey into the natural world, they will discover that numbers, patterns, shapes -- and much more -- can be found by observing everyday plants and animals. What if animals and plants knew math, just like you? Would leaves fall in patterns? Would whales enter a race? 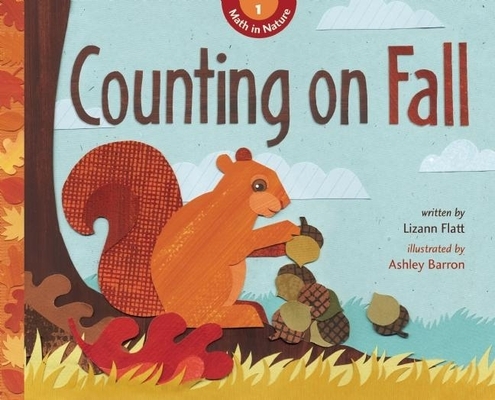 In Counting on Fall, the first title in the Math in Nature series by award-winning author Lizann Flatt, nature comes to life to help children grasp concepts of number sense and numeration. The engaging "What if?" format of this informational picture book is sure to delight five- to seven- year- olds. Each of the four books in the Math in Nature series will cover one season of the year and one area of the math curriculum. Colorful, cut- paper collage art uniquely evokes the natural world, while two levels of text -- one a lyrical story, the other asking children to problem- solve -- bring the reader to a full understanding of the math concept being covered. Lizann Flatt has written many informational books for children, including The Nature Treasury and Let's Go!. A former editor of chickaDEE Magazine, her children's writing has won many honors, including a Distinguished Achievement Award from The Association of Educational Publishers. She lives in Muskoka, Ontario. Ashley Barron is a Toronto-based illustrator who specializes in cut-paper collage. Her award-winning illustrations have appeared in a variety of magazines, children's publications, websites, posters, animations, and set designs. She has a deep appreciation for nature and finds inspiration in the vast Boreal Forest. "The book is rich in descriptive language and follows a logical timeline . . . a fun selection for reading or browsing and a nice supplement to units on the history of transportation."